Triple Crown’s Rock Mylady put in a stellar performance to take out the De Bortoli Wines BenchMark 75 Handicap (1600m) at Gosford on August 23. The son of Road To Rock out of Myladys appreciated the drop in class and distance from a BenchMark 78 and 2000 metres under a faultless ride from Kerrin McEvoy. McEvoy had the five-year-old perfectly poised one out and one back in fourth position with a lap full of horse heading in to the home turn until the well-backed favourite let down beautifully for a head victory over The Iron Maiden. 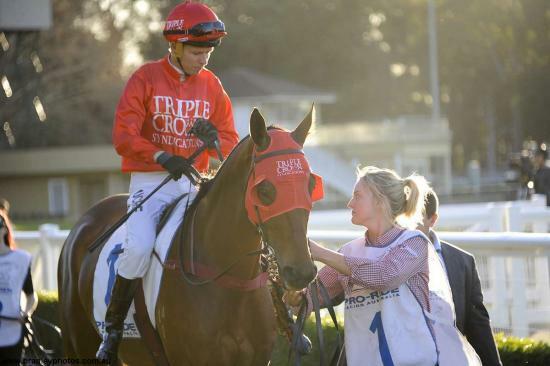 “Macca gave him a gem of a ride and it’s great to see our syndicate partner, Triple Crown, get some more success with this horse. “The weaker class and drop back to the mile clearly worked so we’ll just need to be careful where we place him moving forward,” said co-trainer Paul Snowden. Rock Mylady has now won four races and over $100,000 in prizemoney from just 15 starts.